I remember singing around church campfires as a kid, “It only takes a spark to get a fire going…” Anyone who has attempted to start a fire with just one spark understands that… it ain’t that easy. Prepare modern and practice primitive. You won’t catch me in the woods without several Bic lighters. When I really need to start a fire, I whip out my Bic. For primitive fire craft, I may start a fire by friction. If those modern fire starters fail, primitive practice will pay off. 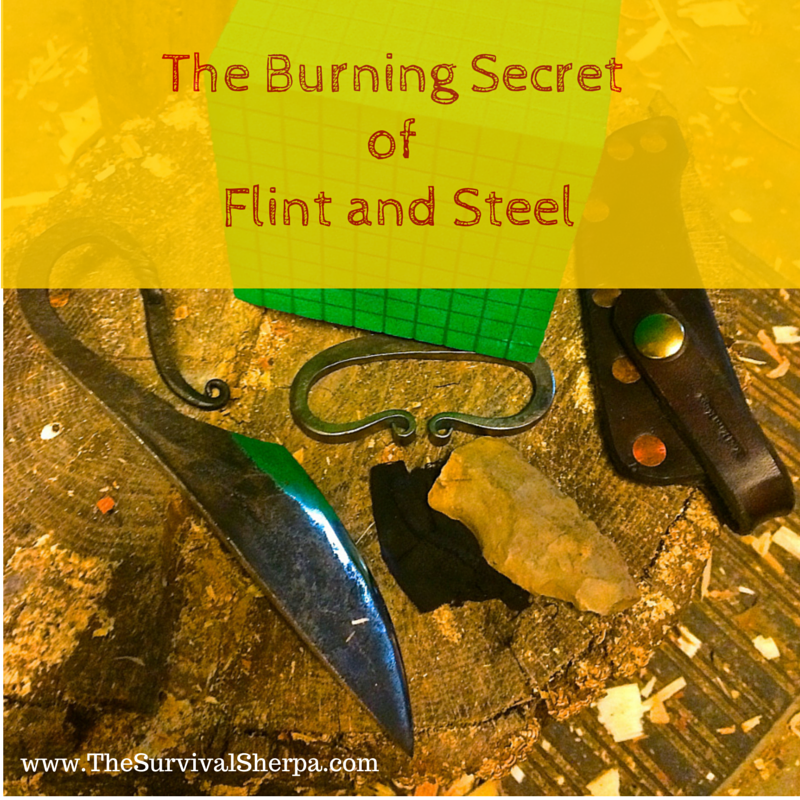 Before the advent of butane lighters and matches, flint and steel was the method of choice for fire starting. In the 17th and 18th century, longhunters, woodsmen, and towns people alike relied on this method. 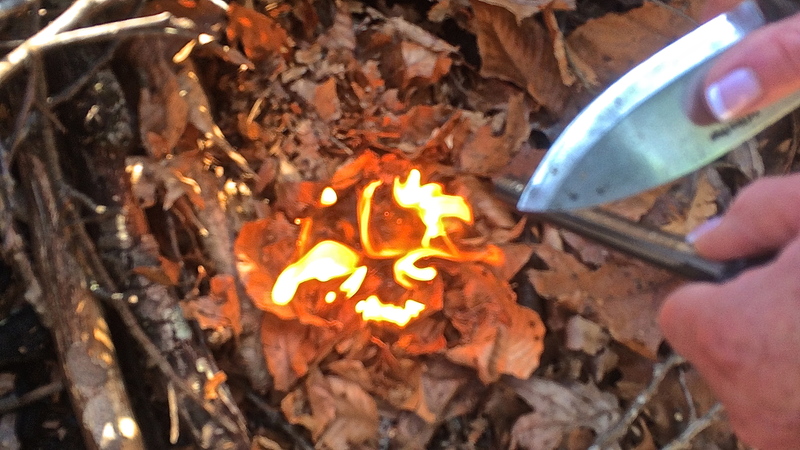 In the woods, charred plant material in a tinder box would receive sparks from the steel. Char cloth was for city folk. Dried tinder material was placed on top of the ember while in the tinder box and blown into flame. Closing the lid of the tinder box smothered the charred material for later use. Hopefully, this article sparks your interest and sheds some light on the traditional mountain man method of making fire. Long beards and tasselled buckskin are not prerequisites to appreciate sparks flying from steel. This article is a blend of how-to with a dash of curious survival science. Armed with new knowledge, you’ll be able to explain to your buddies the little-known secret of steel’s ability to spontaneously combust. That rusty shovel in your shed is producing heat. It doesn’t feel hot to the touch but rust (oxidation) produces heat. Just not fast enough to burn the barn down. You see, rust is a sign that your tool is burning… very slowly, but burning none the less. When iron comes in contact with air, a chemical reaction called oxidation begins. Oxidation produces rust and heat. How can you manipulate oxidation to create fire? In simple terms, speed up this exothermic reaction until you see sparks. Iron is a pyrophoric material that ignites instantly when it comes in contact with oxygen. The reason that rusty shovel hasn’t set your hay on fire is that the steel is in a big hunk of metal slowly “burning“. The heat from oxidation is absorbed in the atmosphere before ignition can happen. A proper fire lay requires surface area. You need wood in pencil-lead size, pencil size, and thumb size wood with even finer hair-like material in the tinder bundle. Even with highly combustible fatwood, surface area matters for quick ignition. Take a thumb-size piece of fat lighter and try lighting it with a ferrocerium rod. You might do it, but only after scraping the rod to a nub. Now you’ve wasted a resource. Instead, create lots of surface area by removing resin-rich shavings into a pile. Then make a feather stick from the fatwood (more surface area). One or two strikes from your ferro rod and you’ll have a flaming pile of pine shaving to ignite the feather stick. The same principle applies to iron’s ability to spontaneously combust. You have to create surface area. Note: Before we continue, let’s clear up a common misunderstanding about ferrocerium rods and flint and steels. Yes, they both throw sparks but each has different properties. Mainly, ferro rods produce 3,000º F sparks while flint and steel sparks are in the 800º F range. Generally, flint and steel needs charred material for ignition. 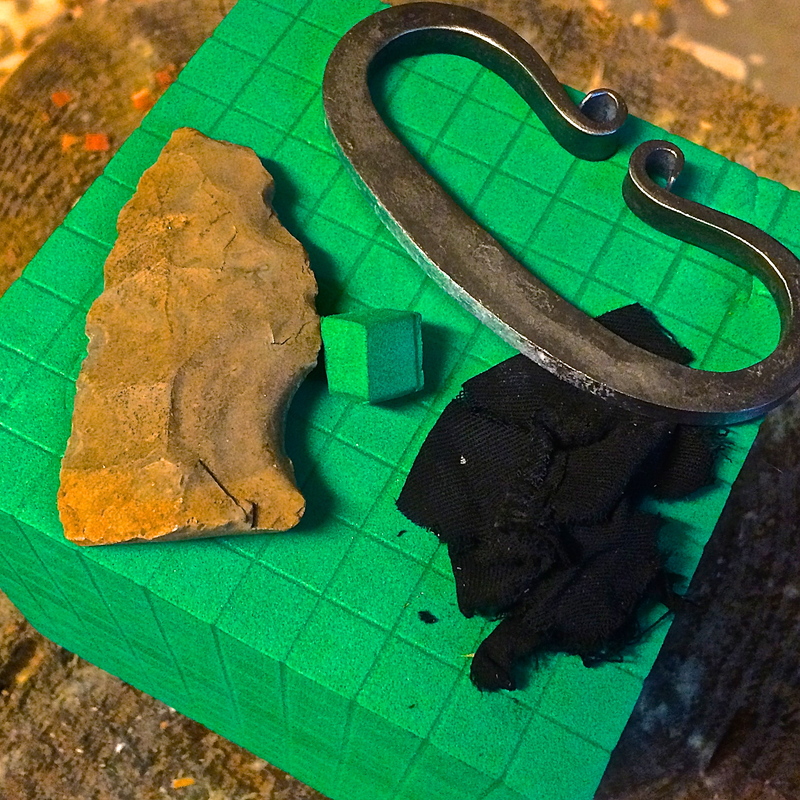 Ferrocerium will ignite un-charred material, marginal tinder, and melt tarps… ask me how I know. Now, back to flint and steel. Striking steel with a hard object like flint/chert breaks off tiny pieces of steel with greater surface area than the original hunk of metal. These small particles meet oxygen and spontaneously combust. Sparks fly! What you’ll need to start a fire with flint and steel… mountain man style. Hold the steel in your strong hand and the flint in the other. Lay a piece of char cloth over the top of the flint and hold it near the edge of the rock with your thumb. In a downward motion, strike the stationary flint with your steel in a smooth motion. Be careful not to hit your knuckles on the sharp rock. Once a spark lands on the char cloth, you should have a glowing ember growing in circular fashion. The other method is to hold the flint in your strong hand and strike the stationary steel. I use this method when lighting charred plant material in my char container. It’s a safe way to strike sparks off the spine of a knife. Keep the knife stationary and strike the spine with the flint. Flint and steel are becoming my preferred method for starting fires. Here’s a quick video on the science behind flint and steel with a demo at the end. My daddy made a living welding and plumbing. Growing up, my hands were no stranger to side grinders. I wore out many grinding disks shooting streams of glowing sparks. What I didn’t realize then was that these tiny particles of iron were igniting when they came in contact with oxygen. I’d assumed they glowed from the friction of the grinding wheel. Now you and I know the burning secret. Thank you so much for explaining this subject. I never knew [or forgot over my years] (and because I too thought that the sparks at my grinding wheel were from the wheel grit or from the steel, or both). I’ve read articles saying “it works”, and basically how to strike the fint onto a fuel; but those other Prepper explanations motivated me only to leave off my Fire Starting list–flint/steel. Flint and steel is going on my Fire Starting list, except that I will find my own flint and use a searched for and selected old steel tool. Glad it helped, Mark! F/S has a steeper learning curve than ferro rods but just needs a little practice to own the skill. Old files make great steels. We’d love to hear updates on your progress, brother! Great tutorial, . I would love to know more about the knife in the first picture- steel type, how large the blank was before forging, additional pics/dimensions. Looks like a nice little blade/fire steel. Thank you Josh. The knife is a Red Barn Forge Bushcrafter from Georgia, 1095 high carbon steel, 4.5 blade.